Late 2018, Dutch website productwaarschuwing.nl reported that the number of recalls and safety warnings for food once again increased, to 118 cases. One-third of these concerned bacterial contamination, and therefore our food safety. Cross contamination can occur throughout the process, from production to consumer sales. 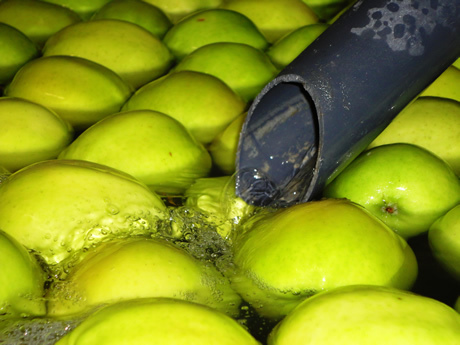 Applying water purification in the fresh produce production and packing process ensures products can be cleaned up to 100%, that 90% of the total wash water use can be eliminated and that products have a longer shelf life so that we have to throw out less. How does fresh produce water purification work? 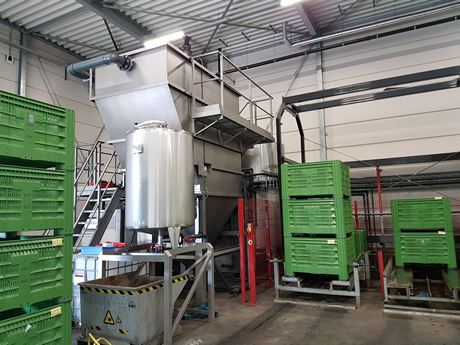 The fresh produce comes from the field and arrives at the fresh packer or processing industry, and via cleaning or dumping systems it comes into contact with water, transport water or wash water. To achieve maximum wash quality and hygiene, it’s necessary to frequently refresh water. This prevents cross contamination of bacteria, pesticides, spores and moulds as much as possible. With a water purification installation, the wash water is constantly cleaned and refreshed in various steps. Research shows that up to 100% of fresh produce can be cleaned this way, before being processed. Besides, this allows the fresh produce sector to save considerably in water, up to 90%! After all, the water isn’t replaced, but constantly cleaned. It could save up to millions of litres of water in the Netherlands per year. VAM Watertech from Borssele is specialised in water purification for fresh produce processors and fresh packers. To show the effect of water purification, they had an independent study conducted by Hogeschool Zeeland and Micro-Analyse Zeeland. Percentages mentioned earlier are shown in this, in the chart and graph shown below. The complete study can be requested from VAM Watertech. 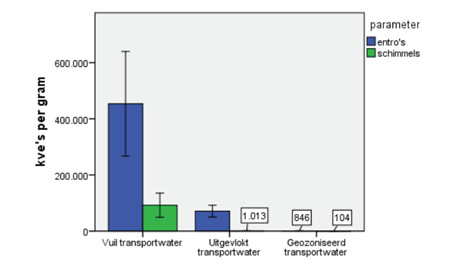 This chart and graph from the study show that the concentration of enterobacteria and moulds on apples decreases strongly because of water purification processes (precipitation and ozone treatment).